How many lift hills? 2! How many big drops? 2! How many helixes? 2! 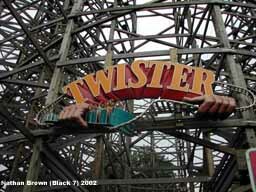 Thats Knoebels Twister...a doubly great experience! The inground tunnel is cool in 2 ways, too. Cool meaning awesome as well as the drastic temperature change. The two best times to ride it is after a rain storm (boy, does that make this baby fly!) and at night time when you fly through the strobe light effect (Smile! Your picture is being taken!) A very nice addition to an already very nice park! Pretty good woodie. Best aspect is the originality. The double helix, unique loading station, split lift hill, and train ride going through support structure add touches of originality to the ride. A little smoother than I expected and the airtime was there just not as much as I would have liked after just getting off Phoenix. Very action packed though and first time riders will have no clue what is coming next. Easily worth at least three rides for any visit to Knoebels. I was actually kind of disappointed by this ride. 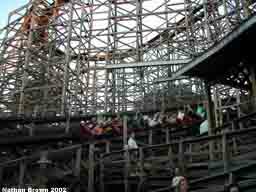 Its a very very good ride but it lacks airtime, something I look for in woodies. There are some very memorable aspects of this ride, however, such as the helix around the station, the curvy loading platform and the split lift. Also, have to like the never-know-whats-coming-next feeling this ride gives. At most other parks it would be the best ride in the park. A bit heavy on the lateral Gs. It gives a great out of control ride. Great ride, almost a 10. Loved the lateral movement, but never got that completely out of control scare necessary for a woodie to get a 10 in my book. I love the surprise of the first mini lift hill that launches you into a hard left that thrusts you 1/3 of the way up the big lift hill. I find the signs on the exit ramp after the ride funny. Everyone stops to read the small print which ironic tells you not to stop and to keep walking. Just barely behind the Phoenix. It is just amazing how smaller parks can have such fantastic wood coaster. 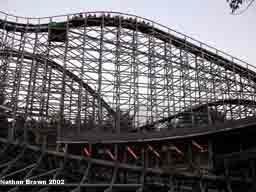 (ie Indiana Beach, Holiday World) Great ride lots of surprises i even like the smell. Amazing that a park that has 2 of my favorite rides also has my all time worst whirlwind. Guess it shows noone is perfect. All I can say is Surprise, Surprise, Surprise - this wonder of a coaster is full of them. The lift hill(s) is just great, the back and forth veering of the track is incredible, and the double helix is the stuff of dreams - really reminded me of the poetic finish on the Beast (plus, it wraps perfectly around the loading station - genius). Also, the setting is just beautiful. 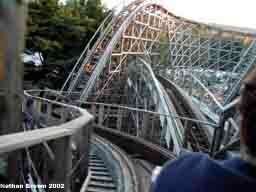 A great coaster - so glad Knoebels added it. Great ride. If you are at knoebels, it is a must ride. The first drop is air-full. The lateral pull on your body makes it rip in half. I widh it had more airtime pops, though. An amazing coaster! The drops are pretty high and with the head choppers it makes it a intense ride. The double helix is also a fun part of the ride. But one of my favorite parts is the underground tunnel, hidden at the back of the ride. It gets real lound and colder when the coaster gos through it. 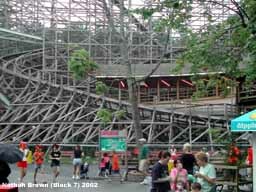 This is ultimatly a fun ride and shouldnt be missed at Knoebels!